Three days had passed and they were still climbing the treacherous paths of Terror Mountain. Fierce, snow-filled winds blew upon them, and they had to huddle next to each other to keep from being blown away. Suddenly, though, they all heard squawking and looked to the sky—a cloud of feathery brown Petpets swarmed the heavens, heading straight for them. Everyone turned back and used the blowing winds to glide over the snowdrifts beneath them. The swarm of gathering Petpets behind them drew nearer, and their bodies grew colder, and the tension grew thicker as Blurfle caught sight of just what might save their day. “A cave,” he shouted, “aim for the cave!” And so they did: They all turned on their sides and aimed for the cave, and in they went, deep into the darkness within the very mountain itself. Needless to say, the Airax lost interest and flew away. “I don’t think being hit on the head is pretty lucky,” Blurfle said. “The Snowbeast?” Blurfle said and wriggled his collar. Fox blinked once, then twice, and twice more before his mouth fell open. And just as they were leaving the cave, a hand reached through the darkness, growled happily, and the Snorkle was gone. Exactly two kilometers that way, they came across a small hut with a tired-looking Skeith inside tirelessly turning a wheel attached to a pulley attached to a thick cable that carried carts up and down the mountain. A short line of Neopets waited for their turn to board, but like all good adventurers, the Petpet Retreaters knew that time was of the essence, and so, when no one was looking, they scurried into a basket and were off. The air was crisp and cool when they hopped out of the basket some minutes later and landed on a bed of softly-fallen, freshly-laden snow that crunched under their tiny feet. Perdy was the first to be dazed by the snow, quickly followed by Blurfle, Fox’s brother, Haunt, and even Marvin. Blurfle quickly snapped out of it. “Yeah, guys, we’ve got to go!” He thrust his paw forward once again, and everyone followed his direction and scurried off behind the lift station. But, unfortunately, it was not a finish, and they had to go to four different locations before they finally found the Candychan sleeping in the frozen boughs of an icicle tree. “How are we supposed to wake it?” Blurfle said. And the Candychan stirred and fell out of the tree. Around it, a perfect imprint of its body lay in the snow. “Um, well, er,” Blurfle said, but Fox quickly pushed him aside. The Candychan snarled, growling just under his breath. “Shut it, Wain!” Perdy spat. Blurfle followed Chester as he crawled through a narrow hole at the end of the ice cavern that he’d taken them through, and then stood up in awe of the massive, sleeping Snowickle before them. Blurfle’s eyes widened and sparkled: the horde was amazing, full of Neggs and weapons and toys the likes of which the little Faellie could never imagine or even possibly conceive. The treasure, the fame, the fortune—such magnificence! “Are we sure it’s sleeping?” Marvin asked. “And it really is a giant Snowickle?” Perdy pondered. “Of course! Why else would I bring you guys here?” Chester flashed her a thumbs up and a geeky, overconfident smile. “Wow, that’s... that’s amazing,” Perdy said and stared on entranced. “Well,” Fox said, “I didn’t come ‘ere just to look at ‘im—I want some of his treasure to to boot!” He set down his red bucket—the Pile of Soot inside whimpered unceremoniously—and the Doglefox dashed off towards the piles of riches, pulling Neopoints and Neggs and anything else small enough to fit inside his pack and stuffing them away for the trip home. Blurfle, meanwhile, was walking up to the Snowickle. “It’s simply inconceivable,” he whispered, “that a Petpet could grow so large.” He reached out his hand and set it gently on the surface of the Snowickle; its skin was colder than ice and smoother than anything he’d ever felt before. “Muhahahahahahaha!” The shrill cry echoed around the chamber, amplified and magnified more times than could be counted in the time it took for Blurfle to feel the beast beneath his hand trembling and beginning to churn. Too late. Everyone had sprinted away from the beast, back through the slender hole in the icy wall and all the way back to the summit of Terror Mountain by the icicle tree. “I’m ready to go home,” Perdy said, and she took a breath, looking petrified. “I will never, ever do that again,” Chester said, gasping for breath. Blurfle was silent, and everyone turned to face Fox. His eyes were wide and he was feeling up and down his body in a mad panic. Suddenly, he stood stark-still and the color flashed from his fur. Blurfle slid back through the small hole and stood up as Chester and Fox joined him on either side. He trembled and shook, shivered and heaved for every new breath, but he pushed on bravely into the silent chamber: Luckily, the Snowickle had returned to slumber in the little time since they’d left it be. “Over there,” he whispered and pointed. Chester and Fox turned to look, and all of them nodded. “No,” Blurfle hissed, “we do this together.” He took a breath and, holding it safely inside him, began tip-toeing towards the little red bucket and the Pile of Soot inside it, the Doglefox and Candychan at his sides following silently in suit. Blurfle slowly exhaled and inhaled once more, then for a third and a fourth time before they finally made it across the slippery expanse and up to Fox’s brother. They turned around and stopped dead in their tracks, facing as much of the Snowickle as they’d seen before: The beast had uncoiled itself and then recoiled itself around them, trapping them in a massive ring of its huge, icy, frozen body. “What do we do now?” Blurfle whispered to Chester. “No, oh, erm, was my introduction misleading?” Chester laughed nervously. The Snowickle had dropped its head in front of them, but meters away now, and its eyes shone with greed and longing. It opened its mouth, cold drool dripping from its chops, and its tongue drew closer to them. “Think he’s a vegetarian?” Chester said. “Not a chance,” Fox answered. But then they all felt something warm, wet, and slobbery on their faces and chose to open their eyes instead: The Snowickle was smiling and licking them rather affectionately. The Snowickle withdrew and seemed to pout at them, but nevertheless, it turned away and lay itself back down over its mountains of treasures to sleep once again. And then, quite quickly, the Petpets dashed off through the hole in the wall and back to the open air of the freedom outside. 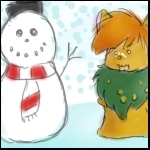 “So, I guess this is goodbye?” Blurfle said to Chester, once again beneath the icicle tree. “Get on with it, kid,” Fox said. The Candychan smiled and grinned and shook Blurfle’s hand and their ride back to Happy Valley went without flaw and their trek across the plains was even more joyous now than when they had crossed it the first time. And although the end seemed fitting, it wasn’t over yet. Blurfle approached the fire and took a seat with the rest of the Petpets gathered there, including but not limited to Perdy, Marvin, Chester, and all the others who had joined their adventure to the top of Terror Mountain and beyond. “Muhahahahahahaha!” the Wain wailed and this time, everybody laughed. Want more of the Petpet Retreaters? Check out my first publication, Tales of a Petpet Campfire. The Altador Cup always gets to me.